filmboards.com - Miracle (2004) 1980 USA Hockey jersey?! Sports Films : Miracle (2004) 1980 USA Hockey jersey?! Miracle (2004) 1980 USA Hockey jersey?! I found a website about a year ago that had the authentic jerseys made by the company that made them for the film-- or claimed to anyways. They were exact in every detail and you could order them but you couldn't get the actual players names/#s on them for licensing reasons. That was fine with me as I wanted my own name and # on it. But now, I can't seem to find that site! It was the only site where they were made out of the materials that were used back in 1980. It did tout that they were the same jerseys manufactured for the Miracle movie though and that they were made to the exact specifications and fabrics of the 1980 Olympic USA hockey team. Now it looks as if that site no longer exists. I've contacted the company that I think made the jerseys for the film and am awaiting their response. Should that fail, any help finding an exact replica of the 1980 Olympic jersey that I can personalize? I've looked at other sites, but I'm having trouble finding the exact jersey... the blue nameplate on the back gives away the jerseys that are not 100% accurate. There is a small strip of white between the blue on the shoulders and the nameplate. Thread_Killer_of_IMDb is out there. And it absolutely will not stop, ever, until your post is dead. Re: Miracle (2004) 1980 USA Hockey jersey?! I looked up how the US jersey looked like in the 1980 Olympics. You mention that the name bar isn't blue, but all the photos I've seen has the name bar as being white lettering on a blue background. This is for both the white and blue jerseys. Here's a link to a story of Mark Pavelich's white jersey being auctioned off: http://www.sportscollectorsdaily.com/another-1980-u-s-olympic-hockey-team-member-selling-jersey/. 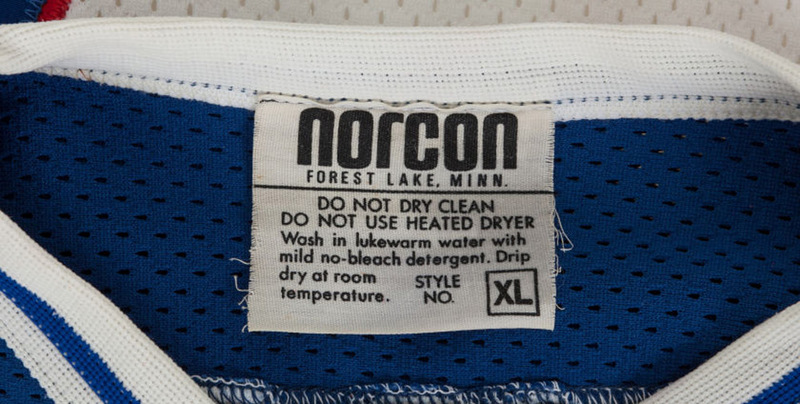 It's mentioned that a company called Norcon Manufacturing, from Forest Lake, Minnesota, produced the jerseys and has a tag on the inside collar and on the front of the jersey to the lower left. Here's a picture of the collar tag of Phil Verchota: http://www.extravaganzi.com/wp-content/uploads/2014/02/Phil-Verchotas-Miracle-on-Ice3.jpg, from http://www.extravaganzi.com/phil-verchotas-miracle-on-ice-hockey-jersey-at-heritage-auctions/ and the front tag from Mike Eruzione's jersey: http://s19.photobucket.com/user/spyboy1/media/TSG%20Blog%202013/Norconlabel.jpg.html, from: http://thirdstringgoalie.blogspot.ca/2013/02/1980-united-states-olympic-team-mike.html. Norcon doesn't look like it exists anymore, and I can't say if it changed names, dissolved or got bought out. Maybe one or more of the people involved went to other companies and helped produce authentic replicas. Hopefully you can find one that is authentic and is high quality as well. I'll have to see if I can find who made the jerseys for the film. Missed that you mentioned that. If AIS sounds unfamiliar, perhaps ask them on their Facebook page.